Being a professional real estate agent can be personally and financially rewarding. Success in the industry however, is often related directly to the tools, resources, training and support a company provides its sales team. Kinlin Grover Real Estate agents have many reasons why they're successful and why like working here. "Kinlin Grover has cultivated a very positive working environment with its warm and friendly agents and supportive management team. The Company is like my second family! I've been very happy working here for the past twelve years." 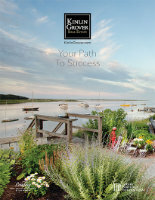 We have real estate offices throughout Cape Cod. Contact of of our Branch Executives for a personal interview.